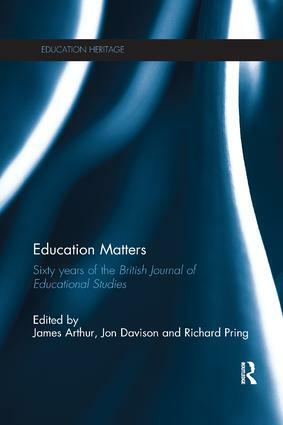 Education Matters draws together a selection of the most influential papers published in the British Journal of Educational Studies by many of the leading scholars in the field over the past sixty years. This unique collection of seminal articles published since the first issue of the Journal provides students and researchers in education with an informed insight and understanding of the nature the development of the field of Educational Studies in the United Kingdom since the Second World War. It also assesses the current position of Educational Studies and explores the possibilities for the development of the field in coming years. Compiled by the journal's editors, past and present, James Arthur, Jon Davison and Richard Pring, the book illustrates the development of the field of educational studies, and the specially written Introduction contextualises the selection, whilst introducing students to the main issues and current thinking in the field. Each of the twenty articles includes a preface which highlights the changing conceptions and development of, or consistency in, educational thought over time, as well as debates and conflicts in the seminal articles by key educational thinkers that have been published in the Journal. Jon Davison has been professor of teacher education in four UK universities including the Institute of Education, University of London, UK where he was also Dean.